Our Essence range is nothing short of exceptional and it’s not just because we say so. The science behind all our products is second to none and Essence is no different. Not only does Isagenix® meet the industry standards for quality, we exceed it with our no-compromise standards. We then select naturally occurring aromatic plants based on evidence that shows benefits, paying special attention to the plant origin and the part of the plant from which oil is extracted. Depending on the species and plant part, our oils are extracted using steam distillation or cold pressing. Steam distillation passes steam through the plant material to collect the essential oils, while cold pressing extracts the oils; by mechanically crushing the plant followed by separating the essential oil via centrifugal force. Then the testing begins! The extracted oils are sent to Isagenix for organoleptic testing and approval, to make sure the appearance, colour and fragrance meet our high standards. If the oil is not up to the standards of our trained experts, it is rejected. After a thumbs up from the Isagenix team, the oils are sent to industry-leading, third-party laboratories in both the US and Canada to perform identification, purity, analytical and microbiological testing. These thorough tests detect all the components that make up the specific oil and ensure that each meets the high standards set by the International Organisation for Standardisation (ISO) — which validate the quality and purity of the oil. Every lot is tested for purity and quality again before they’re released for bottling! The Isagenix Quality Control and Assurance team approve the oils to be filled, bottled and labelled at internationally-regulated food facilities that have been thoroughly vetted and meet our no- compromise quality standards. The oils are sampled and submitted to third-party laboratories for microbiological testing to ensure the oils are 100 per cent pure and free of bacterial contaminants. An additional organoleptic test is also performed to ensure quality. Samples from each batch of Essence are shipped to Isagenix World Headquarters in Arizona for final evaluation by our Quality Assurance team. Sensory, analytical and documentation verifications are performed prior to the oils’ arrival in our distribution centres. Finally, 100 per cent pure, authentic and no-compromise Essence by Isagenix Essential Oil products are packaged in shatter- and leak-proof packaging to ensure that the integrity and quality of each individual oil is safely delivered to your door! There you have it, a step-by-step breakdown of Essence production. 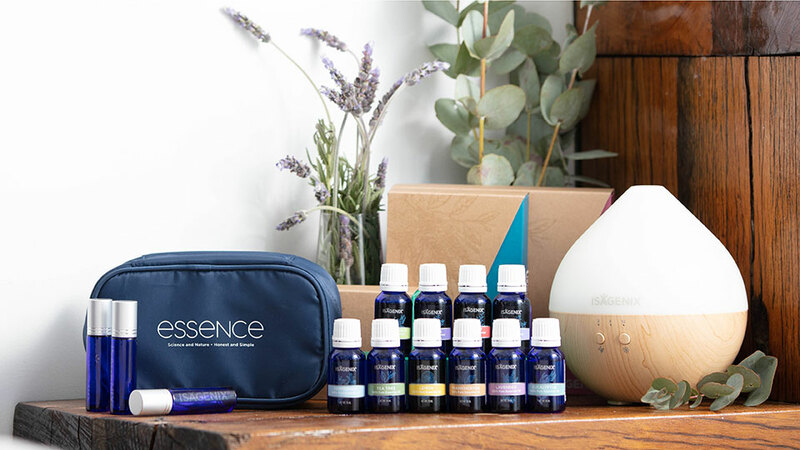 Have a quick read of the Essence Toolkit to get the full Essence experience, then add them to your next order via the Back Office or IsaLife™ app!